Good afternoon and welcome to another brief update on an almost equally brief 'commuter length' audio drama. 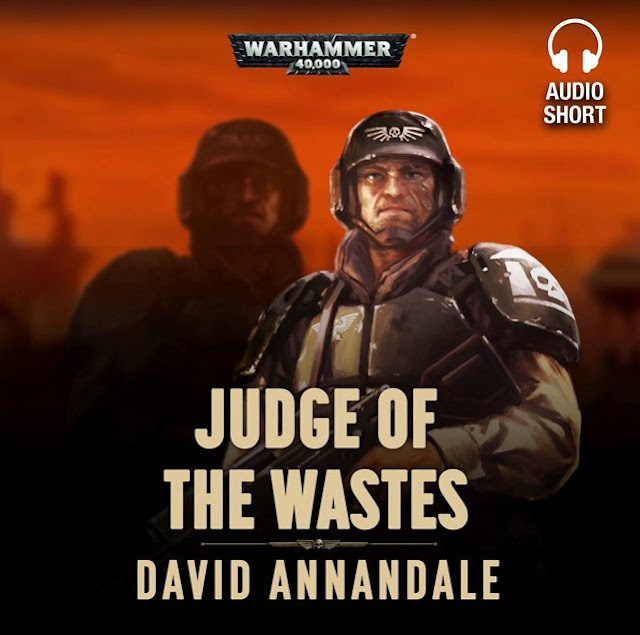 Judge of The Wastes has been available via the audible.co.uk web site for a couple of weeks already, although it has only today been released via The Black Library; which is a bit odd, though the 'dark arts' of marketing strategy are a bit of a mystery to me. The point is I suppose, that it's now universally available and there's very little excuse for not giving it a listen! After executing a fleeing Guardsman, Commissar Arehn starts to see the dead man's phantom – what does it mean, and will it lead him to enlightenment or disaster? On the world of Solennes, the battle between the forces of the Imperium and the heretics has become a stalemate of seemingly eternal artillery bombardments. The land is devastated, and the attempts to gain ground by either side end in disaster. Morale is low, and when Trooper Arehn is caught apparently fleeing the front lines, Commissar Selander does not hesitate in condemning him to a very public execution. When Selander starts to see Arehn after his death, he follows the apparition, wracked by doubts – but what will he find? Performed by Tom Alexander, John Banks, Cliff Chapman, Matthew Hunt and Joe Shire. Apart from wrapping up the final novel in the Niccolo Books series, 'Gemini', which I'll be doing tomorrow morning (! ), I have a short period of proper, uninterrupted prep time for the next two audio books, which will take me through to early/mid November. I also have some audio dramas to prepare, which are scheduled to be recorded before the end of the month, although I'm not yet in possession of the scripts. 'Gemini' had a few surprises in store, as I came to read and prepare it. The final novel of a long and intricately constructed story arc was always going to be challenging, as individual and collective narratives drew to their various conclusions. What made it particularly tricky to 'perform' was the fact that the majority of the novel is set in 15th Century Scotland and some of the language reflected that setting directly. Each sub-section of the book and each chapter heading had a few lines written in 15th Century Scottish dialect; around 8 pages of A4 in total, as well as a sprinkling of lines throughout the general body of the book - which, as I say, was tricky to read fluently. My fingers are crossed that my attempts to assimilate and articulate the dialect aren't overly offensive to any who might listen, knowing how it should sound! I've done my best and can only hope that it's good enough. Of halynes and of armes the deidis. And followis it, he sail of werteu be. And with that, I'll wrap up for now; thanks, as ever, for stopping by.